Southend winger David Worrall has dedicated a vital goal to the memory of his baby son, who died recently. 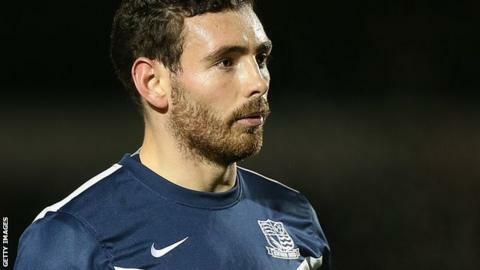 Worrall scored the only goal in Tuesday's 1-0 win at Bury, keeping the Shrimpers in the hunt for automatic promotion from League Two. He told BBC Essex: "It's for Noah, my son, and my girlfriend. I went to his grave and told him I was playing. "It was emotional, I felt like crying. It was for him and I knew he was looking down on me." Worrall scored a free-kick in the 74th minute after coming on as a substitute. It was Southend's sixth successive victory, and the seventh successive match in which they have not conceded a goal. The result leaves the Essex club level on points with Wycombe, who occupy the third automatic promotion place in League Two, with two games remaining in the regular season. Worrall, 24, a former Bury player, said being back with his team-mates had been a comfort. "It's been a tough month, but I think it's an environment where the lads look after you, a little like a family," he said. "The gaffer [manager Phil Brown] is in control, and with my situation he's said let's just go day by day. "We're just so hard to score against, we have 11 men who defend as a team, and we have three strikers who have been on form and never stop working." Brown said: "David has been through the mill just recently, with his baby boy being born prematurely and then dying 45 minutes after he was born. "That's the main reason he's been missing just lately, but every single one of us is right behind him and for him to come here and get the only goal against his former team says a lot about his character."